I’m going to keep things relatively short today as tomorrow is a special day and today we’re gonna be getting some things ready. If I had to sum up this week in two words it would be: snow day … let me explain. If you’re in or from a northern climate, snow days were likely part of your winter experience. The literal explanation of snow day is where snow overnight disrupts your normal routine and you wake up to the radio announcing a long list of cancellations… including school. The figurative sense of snow day focuses simply on the jubilation associated with the realization that you, unexpectedly, get a day off… no school. Oh no worries, we didn’t get snow… but I didn’t have to drive to Angers on Tuesday for classes as students were having a campus wide test that I didn’t need to invigilate. Then today would normally have been a Bible School day but I was only to have one hour of class wherein students were writing a final test on the Epistles. The school administrator offered to administer the test for me to save me the drive. Those two things represented 11 hours of driving that I didn’t have to do. Feels just like a snow day! At some point in the near future, I’m going to put up a post about the Château de Brissac. On my way home from Angers on Monday I stopped in for a quick visit. It’s normally closed during the winter months because it’s privately owned and the owners still live there, but because it’s the school holidays in that part of France, they have limited opening hours. A delightful castle that I can’t wait to tell you about. Christianity often uses the notions of light and dark – the inherent contrast associated with them – to describe what the Christian life is supposed to be like. We take it from the Bible. In him (Jesus) was life, and that life was the light of all mankind. The light shines in the darkness, and the darkness has not overcome it. We are meant to live differently than the vast majority of what we see in the world around us. Not to prop ourselves up or to abase someone else… No, the goal of living differently is that God be glorified. Contrast… it makes something stand out. Here are a couple of pictures of Châtellerault by-night as well as a discus fish in the pet section of our local hardware store. I thought they highlighted well this notion of contrast. If Liz’s photo is the feature picture of today’s post it’s because tomorrow we celebrate her birthday (I won’t say which one! 😉) and she is great example of someone who lives as light in darkness. Aside from the Lord, she is the glue that holds things together and keeps us all running (relatively) smoothly. 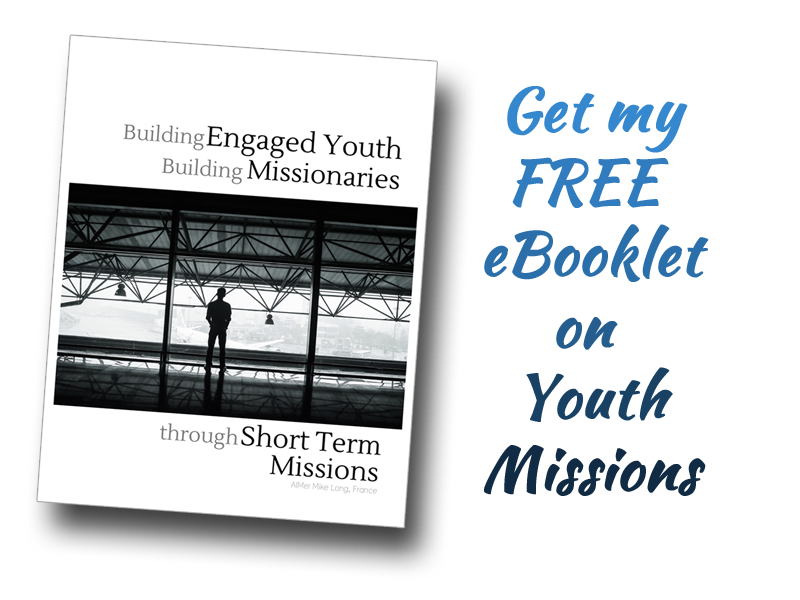 If you’re a young person with a desire to one day be involved in missions…. choose your spouse very wisely and following the Lord’s will. They will bring out the best in you and smooth off the rough edges where needed. I’m not sure we’d still be here if it wasn’t for her – so great is her contribution. God bless you friend & thanks for stopping by! « Back from Bordeaux & …Surprise! Happy, blessed birthday Sister Liz! Grazie Milena! She got the message loud & clear! 😉 … appreciate it…. appreciate you! Thank you Dee… I appreciate that!